So I thought that for the show I would make a few things that I don't normally have in my shop. 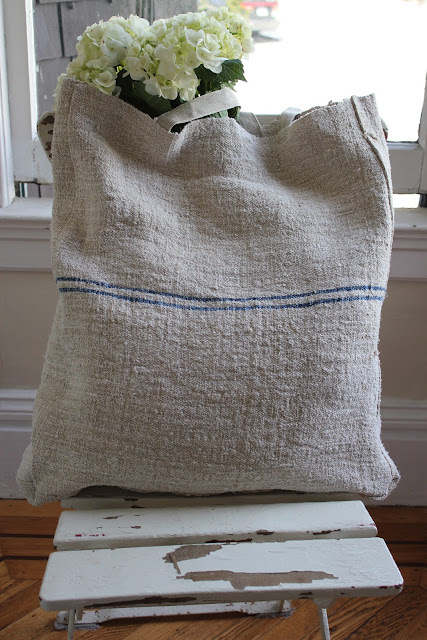 I have been concentrating on grain sack market totes. I made one quite a while ago but it was before I had a sewing machine. I am not exaggerating when I say that it took ten hours to complete. These new ones are much easier, and faster to make, as you can imagine. I love this one. Although my house is not currently decorated in red, I have a deep love of this color. This particular sack is pristine, just beautiful. Look at the texture. Those stripes are bright tomato red! This one is large but smaller than the next one down, which is enormous. I like this one because I rarely see pink and blue stripes on this fabric. I call this tote a diaper bag because of the colors. But obviously you could use it as a beach bag, to hold groceries, etc. It is oversized to say the least. I edged the seams of this one with French linen ribbon. I like this one below because it is very nubby. I just cannot seem to enough of these fabrics! I used two layers of the same ribbon imported from France for the straps. Each bag has approximately 4" wide side and bottom panels. I love this one because I was able to keep the original ties intact. I try to keep as much of the integrity of the sack as possible. Part of the draw to these items is the history behind the fabric in my opinion. 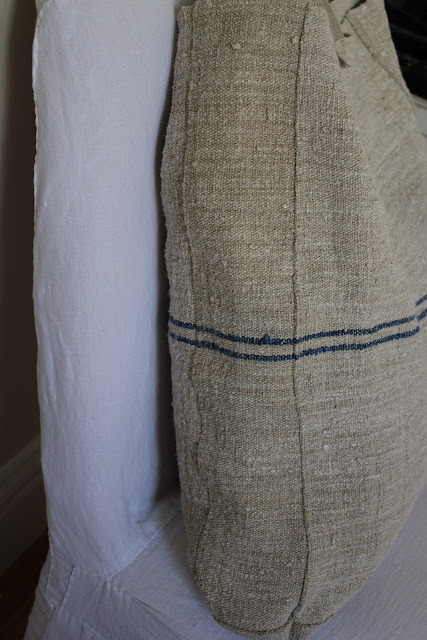 This fabric was never made into a grain sack. I love the variance in colors between the inside and outside. Thanks for visiting. I wish you all a wonderful weekend! I love these totes, especially the red one! Your totes are awesome! WELL DONE!! I'd be grocery shopping in style with a tote like that! Beautifully done. Those bags look fantastic--Happy selling! 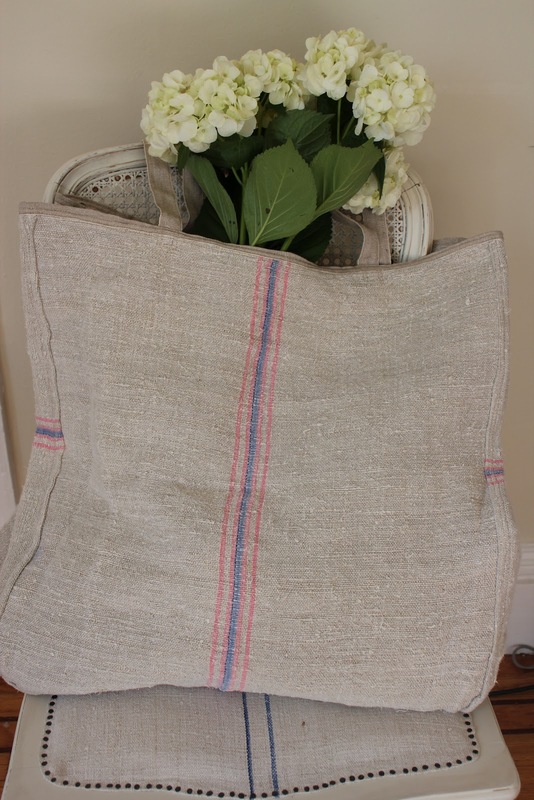 You must be so proud, creating such lovely items from fabulous recycled linen. Wish I could wield a needle like you do. Well done and good luck with the selling - they are gorgeous. 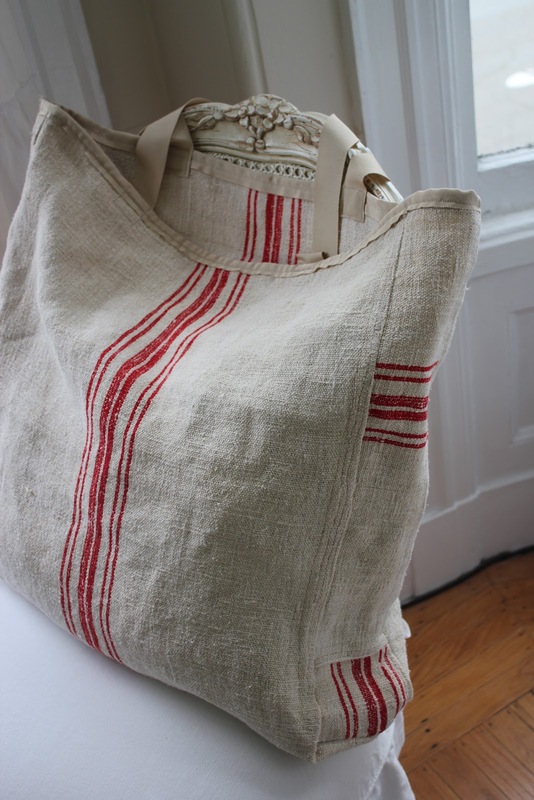 These totes are gorgeous! I'm sure they'll be a hit at your show! Good luck and have fun with it! These are magnificent! I love every one! Best of luck at the show! These are so lovely, Michele...as is your beautiful blog! I am a new follower! I love these bags. They are absolutely beautiful! These are very cute! They would look way cuter than the fabric totes available at grocery stores. 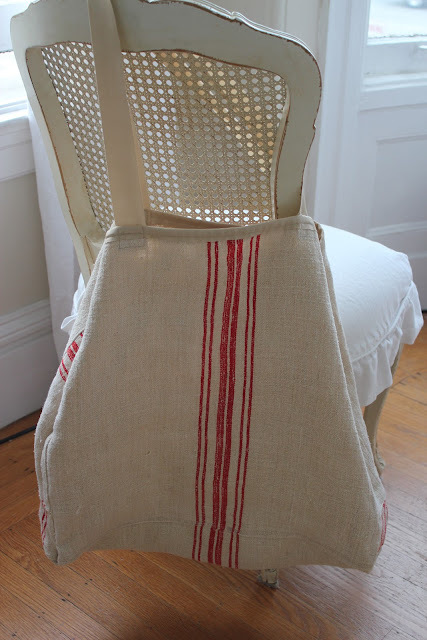 I, too have always loved vintage nubby fabric andthese totes are wonderful. Oh my word I LOVE the pinik and blue one!!! Will you put them in the shop!! Just beautiful!!! How beautiful, Michele! Did you have a hard time cutting in to those grain sacks? lol! I just love them all!!! 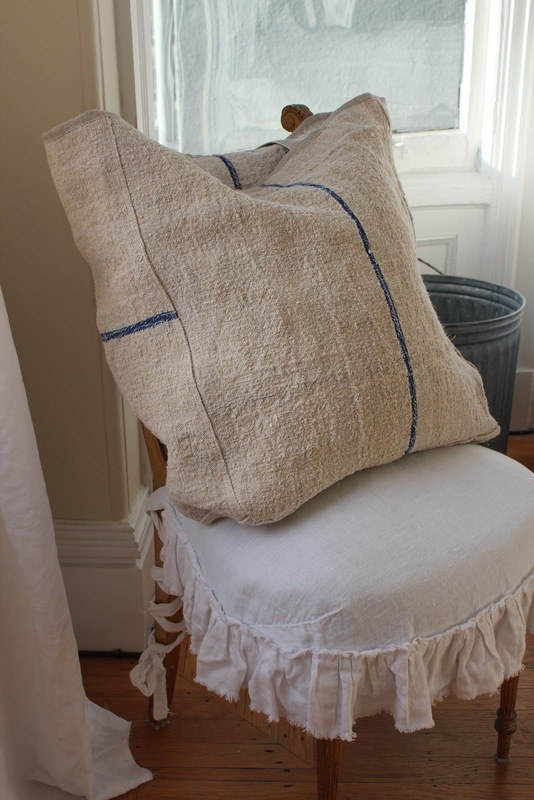 :) Do you know if you can bleach grain sacks....? 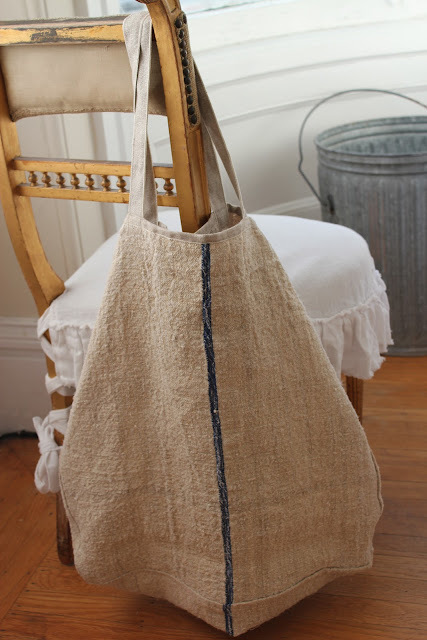 Love those grainsack totes! They are so original. Good luck on your first show. Hope you'll be able to share some pics of it for those of us not able to go. Love the grain sack totes. I went to the Etsy shop, but could not find any of the totes. I really like the one with the blue stripe. I am sure they are going to be a hit. Just gorgeous!!! I hope your show is a big success. Please come share your talent at the Knick of Time Vintage Style Party - it's in full swing right now. 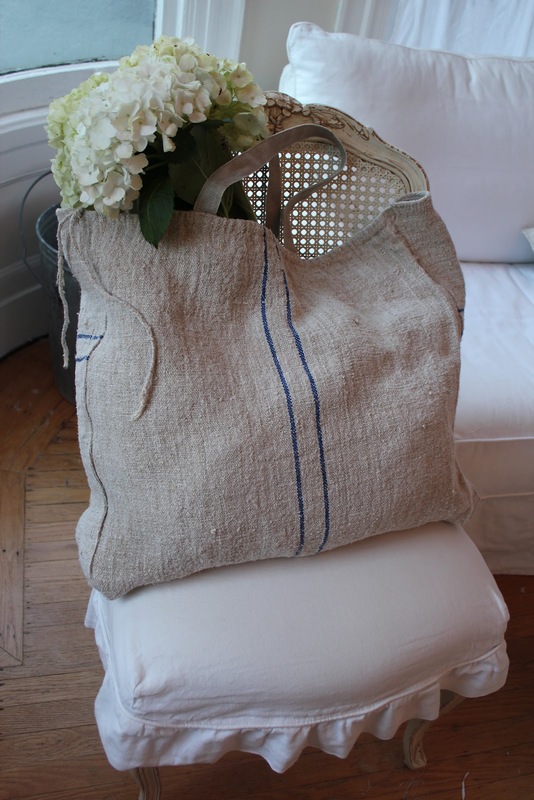 très bonne idée ces jolis cabas en toile de chanvre . j'adore .. le chanvre est magnifique .